The variable output power supplies provide 0 to rated DC output by manually adjusting variable transformer. It is used to control the magnetic field strength of an electromagnet. NEMA-12 steel enclosure has no any attachments or cutouts. It is designed for factory plant or shop environment which requires NEMA-12 integrity. User will punch holes and add conduits or other components to interface with plant settings. 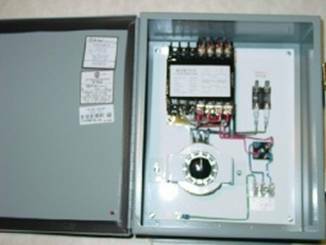 NEMA-12 steel enclosure has built-in input cable with plug, main rotary switch, pilot light and output fitting. It is ready to use. There is no need to drill any holes on the enclosure. User will connect electromagnet(s) to the output terminals of the power supply.